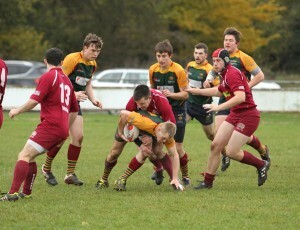 On a grey November afternoon in a not so sunny Norfolk, Norwich Rugby Football Club entertained Hitchin Rugby Football Club who had travelled from Hertfordshire. 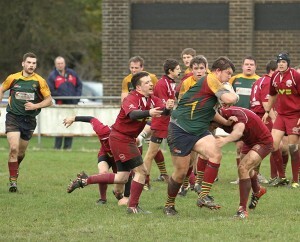 The game sponsored by Anglian Home Improvements was part of the RFU Vase competition. 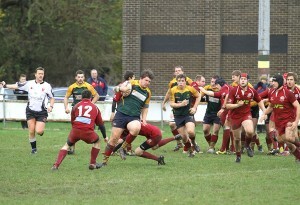 Norwichgave a disappointing below par performance with an unfortunately depleted team. Hitchin had not come for a cup of hot chocolate and a chat, but a full-on strong hard hitting espresso, meaning business. With a reshuffle of the Norwich pack during the first and second half of the game it helping to put pressure back on the visitors, but not for long enough for them to hang on to the possession or change the final score. Mark Fernie….I am coming through! The whistle finally blew for the end of the match with lots of thought and discussion to take place once in the changing room. Next week’s away game, against Canvey Island is anticipated to be a tough match so a full team turn out is hoped for. 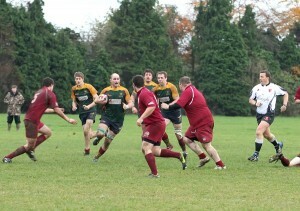 Final score Norwich RFC 17 – Hitchin RFC 27.